PARIS — The French artist Claude Lalanne, part of the Lalanne sculptor couple whose surreal yet often functional works are highly prized by collectors, died on Wednesday aged 93, her agent said. For decades Lalanne formed a distinctive duo with her fellow sculptor and husband Francois-Xavier Lalanne, creating works whose fans included fashion giant Yves Saint Laurent and the iconoclastic French singer Serge Gainsbourg. She had been taken to a hospital in Fontainebleau, south of Paris after suffering a stroke. "Claude Lalanne had the simplicity of artists who work with their hands to build their own poetic world, without worrying about anything else," the gallery owner Jean-Gabriel Mitterrand, a nephew of former French president Francois Mitterrand, said. The artist, who was still working in her studio in the village of Ury last week, studied architecture at Paris's renowned Beaux Arts school before turning to art. "Les Lalanne" as the couple were known – she met her husband, who died in 2008, at a gallery in 1952 – created baroque works large and small, with whimsical imagery often fused with intensely realistic renditions of leaves, vegetables and animals. They intended their works to be functional – last week she was working on a staircase for the American architect and designer Peter Marino. "Claude Lalanne was a poet of forms and matter, who drew her inspiration in nature," President Emmanuel Macron said in a statement, praising sculptures as well as tables, vases and other furnishings that "reconciled beauty with utility". Her funeral will be held next Tuesday in Ury. In an interview in 2013, Claude remembered how "the critics completely ignored us" when she and her husband first showed their work. "For them, making sculptures which had a use was a complete nonsense," she was quoted by Christie's auction house as saying on its website. One of her best-known sculptures was "L'Homme a la Tete de Chou" (Man with the Cabbage Head), a 1968 work which Serge Gainsbourg chose for the cover of his 1976 concept album of the same name. She designed objects for the home as well, including intricate candlesticks or benches – one had two crawling crocodiles as the backrest. In the late 1960s, Lalanne began several collaborations with Saint Laurent on jewellery as well as two robes, one with a sculpted copper waist, the other with a copper breastplate. At the massive sale of Saint Laurent's collected artwork in 2009, a set of 15 Lalanne mirrors went for 1.8 million euros ($2 million at current rates), a record for the artist. 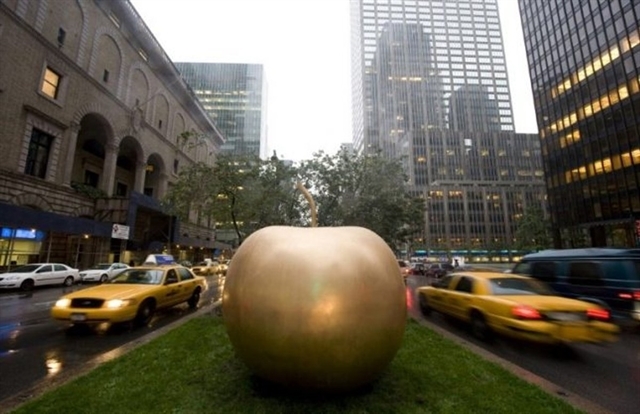 That year she and her husband were the subject of an outdoor showing in New York of several works along Park Avenue, including a shiny golden "Pomme" (Apple). "Claude Lalanne's personality functioned as a fortress against bad taste and pretentiousness," Mitterrand said. Despite their success, Claude Lalanne was unable to stop the city of Paris from razing a few years later their fantastical sculpted park for children in the Les Halles district in the heart of the city. Inaugurated in 1986, the "Lalanne Garden" was a mischievous oasis tucked away a stone's throw from the hulking Les Halles shopping centre and transport hub.